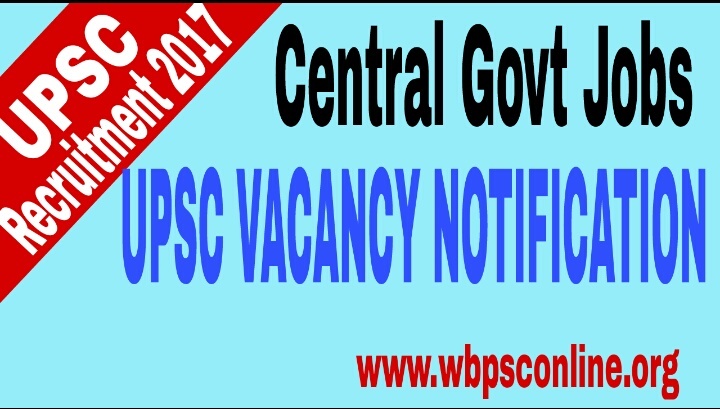 UPSC Vacancy Notification 2017 for Central Govt Jobs in Various Posts: Union Public Service Commission(UPSC) has advertised a recruitment notification for central govt jobs in various posts under the different Ministries. Online applications are invited from the eligible Indian Citizens to the following posts(Given Below) through only the official website(See Url Below). Advt. No. 18/2017. Online applications are invited for three Marketing Officer(Group-III) posts(UR=01,SC=01, ST=01) under the Department of Agriculture, Cooperation & Farmers Welfare, Ministry of Agriculture & Farmers Welfare. Educational Qualification: The candidates having Master’s degree in Chemistry/ Agriculture Chemistry/ Dairy Chemistry/ Dairying from a recognized University or its equivalent qualification with 2 years experience in the field of Analytical Work of Organic Materials are eligible to apply for the required post. Age Limit: Age of the applicants should be 30 years. Pay Scale: Rs 44900/- (Level 7). Online applications are invited from the eligible Indian Citizens for three Assistant Engineer posts(UR=01,SC=01,OBC=01) in the Central Ground Water Board under the Ministry of Water Resources, Govt of India. 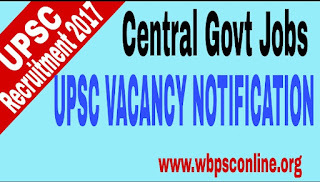 Educational Qualification: The candidates having Bachelor’s degree in Drilling or Mining or Mechanical or Civil or Electrical Engineering or Petroleum Technology from a recognized University or its equivalent with one year experience in Repair and Maintenance of Automobile Machines and Equipment are eligible to apply for the said post regarding UPSC Vacancy Notification 2017. Age Limit: Age of the applicants should be 35 years. Eligible candidates can apply online for 4(Four) Junior Research Officer (Research Statistics & Analysis) posts (UR=03,OBC=01) in Union Public Service Commission. Educational Qualification: The candidates having Master’s degree in Statistics or Operational Research or Mathematics or Applied Mathematics or Applied Statistics or Mechanical Statistics from a recognized University with two years experience of Analysis of Statistical Data and their Interpretation are eligible to apply for the said post. Application Fees: The applicants are required pay application fee of Rs 25/- (Other than SC/ ST/ PH Candidates) through online/offline mode. Online payment can be made by using Net Banking, Visa/Master Cards or Credit/Debit Cards and offline payment can be made through any branch of SBI by cash. Interested and eligible candidates can apply online for the above mentioned posts through only the official website at www.upsconline.nic.in within 12th October, 2017.